Discussion in 'DiRT Series' started by GTPNewsWire, Feb 3, 2019. This article was published by Jimmy Broadbent (@Jimmy B) on February 3rd, 2019 in the DiRT Rally 2.0 category. MarcoM and Theiceman1 like this. Tomorrow I'm probably going to pre-order the Delux version. soundfx and MarcoM like this. I'm sure the magic is back until Codies decides to patch the game once in the 90 days after release and the DLC planned never materializes before moving onto the next DiRT game. It's the same **** with them. DiRT Rally 2.0 might be the last chance I give them considering how they basically fire and forget their games. I_Leak_Oil, gh229, Pfei and 1 other person like this. From watching the video, i didn't get the 'The magic is back' vibes. Pfei and oneloops like this. So, tomorrow I'm probably NOT going to pre-order this game. ^^ I have already pre-ordered this for PC. 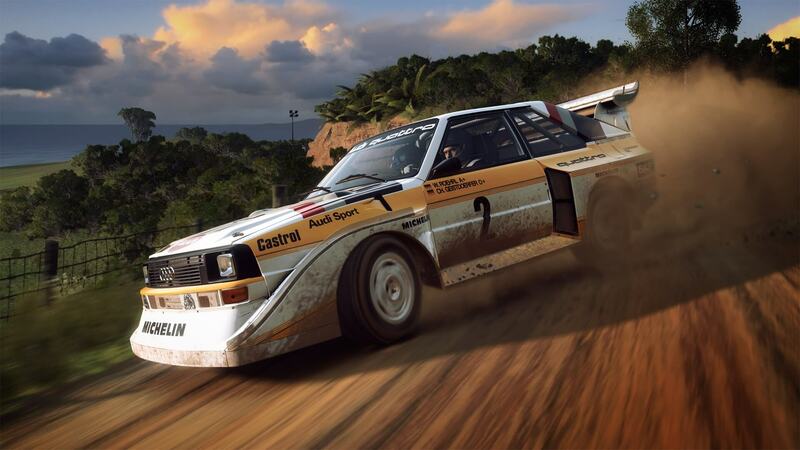 I fancy a rally game and enjoyed the 'raw' Dirt Rally more than the glitzy Dirt4. Graphically from the videos I have seen it doesn't look a big jump up from Dirt Rally/4. I'm taking a punt on this one (I will also get WRC8 in September so this should give me a Rally fix until then). No photo mode again confirmed but I like a challenge from replays and screenshots so I hope I can see some upgrade in visuals being on PC this time. The negative with the 2.0 stages is the lack of unique mileage per country. With “Your Stage” from DiRT 4 ditched, Codemasters has returned to the method of cutting and reversing two longer stages. I totally expected this, and I am not the least bit tempted to consider this game because of it. What on Earth is Codemasters smoking to make them believe this is adequate for a rally game? Why even bother recording pace notes if you'll be repeating the same few routes ad nauseam? Pfei and lancia delta hf like this. Bad tarmac driving, no rallies from dirt1 from the start. No thanks. Il'buy the full version afterDLC seasons and patches. Right now way more interested in wrc8. I actually quite like the tarmac feeling in DR. DR2 improves on that, not much, but still. So I will buy it. The critisism on stages. Also that is a thing that did not bother me in DR, nor will it bother me in 2. The time of day and weather variations will make it again interesting enough for me. CHEN255, kembro and potvinsuks like this. I'm also looking to WRC8 as potentially my next rally game purchase, especially with it being ported to the Switch. Hard to go wrong compared to what Codemasters is up to anymore. MrCrynox and Pfei like this. I always thought Dirt Rally 1.0 was a great platform to build on and make it brilliant eventually, with its biggest problem being lack of tracks and cars (to a much lesser extend). I have no idea why they have to scrap the previous game's content every time and start again only to end up with the same amount of repeated tracks and 90% of the car list with a few variations here and there. Surely the engine is the same and visuals similar enough to be able to keep the previous content and just add new stuff in? I don't think I can be bothered to play a slight variation of the same game with the same problems for a third time. paulpg87, Pfei and lancia delta hf like this. So much negativity that I don't really get. You know what, I think Codemasters have gone about this in the wrong way. I think they should have taken the content from DR1, upgraded it and released with maybe one or two more locations. Then add the other new locations in over time as DLC. They've decided to do it the other way around it seems (although to be determined) and no doubt they'll suffer backlash for upgrading the 'old' content later. But we on this forum and a genuine interest in the game should know better. Either way, the end result will be the same - 8-10 locations with improved quality over DR1. An improved set of cars over DR1 (with maybe a few fewer due to the 'WRC' homologation being offset by numerous new ones). And improved physics and gameplay to go with it. Don't let a search for perfection be the enemy of something good, an improvement on the Dirt Rally nearly everyone here loves. If you play VR then I understand if you're not interested yet, although I've no doubt they'll add it having seen the reaction, but otherwise I see no reason to look down on this title. The original was incredible, but lack of support was its main problem. Tarmac is never going to be AC. Dirt 4 had huge problems with its stage generator, but this is back to the formula of the original, with a base now and at least 6 locations (minimum of 2 rally, hopefully more) to come within the first six months. Support it, and it has the potential to grow further. CHEN255, Brend and MarcoM like this. And maybe most importantly, B: Codemasters has always had massive problems with post launch content, and in a world where such things are considered common place, it really doesn't show much confidence that Codemasters' mantra for the DiRT games is simply to **** it out into the world, make a single patch for 90 days, and ignore it until they invariably announce yet another game. Doesn't help that the vast majority of the vehicles that have been in the DiRT games have been in some form or another, used since the original DiRT nearly a decade ago. DLC, if used correctly, can give people reason to pick up a game that they otherwise shelved. Codemasters does not seem to think that, and it's killing their ability to have casual players, and hell, maybe even a few sim racers, care about the game longer then maybe the 30 days or so they'll play it. This has been a worrying pattern going back to the original DiRT, and it makes me wonder when people are just going to be fed up with it and stop giving Codemasters the benefit of the doubt. I'm already very close to. Again - how long can people accept what Codies does, especially when you consider the fact that not only have they been doing this for nearly a decade since the first DiRT was released, and when said problems could have partially if not fully solved by welcoming Evolution into the fold, instead of taking them out to the shed to be murdered after one game under their banner. I mean, I pre-ordered the game just yesterday because chances are, I'll still enjoy it, and many of the other rally games on the market right now feel incredibly cheap and look like trash graphically, and it's obvious that no matter how they try to gussy it up with official licenses and such, it will continue to feel cheap because of the gulf between the mid tier developers who barely scrape by on niche genres, and those who have the ability to take a few hits financially. But there have been many red flags for the DiRT series since the release of DiRT Rally, the DiRT 4 fiasco notwithstanding, and even going back further. considering how often sim racers trash and dump on developers for reasons, rightful or not, the fact that people are treating DR2 as a show me game is good, especially when you consider the history present. I agree with you on all that, but I feel they are trying to address it. Codemasters' management are clearly frustratingly slow to change. They seem determined to prevent anything having focus (must have hill climb, must have landrush, must have USA stages and American V8s) and are constantly in pursuit of doing a lot of things OK rather than one thing really well. But your earlier point about "DLC failing to materialise" is hardly fair. That's one of the areas they've actually responded to here. They've already committed to 6 locations and 10 cars with the idea that more will be feasible if it's successful. Would I like that to be all the original DR1 locations and some guaranteed new ones over a year of support? Sure I would, but I'm not going to slap them down for taking one step in the right direction rather than sprinting towards it. I just hope we can encourage them further down that path. DR1 was the birth of a new studio to me. I hadn't played one of their games since CMR2 or World Touring Cars (whichever came latest) so it was new. Was Dirt 4 awful? Debatable - I for one thought it exceptionally bland and you're right, it dissipated the goodwill DR1 had built up in me - but it was an attempt to do what we had been asking for in building a rally game without repeated stages. It didn't succeed but they gave it a shot. Now we asked for more of DR1. With support. We asked for tyre compounds. Stage degredation and evolution. Handcrafted stages. We're getting that. In a base game that has 6 months of support announced and, crucially, pre-sold. Is it going to be the game of everyone's dreams? No. But as I said, it's steps in the right direction. Still preordered the day 1 edition and sure I’ll like it, but really wished they expanded on the stage generator because just like DR1 the stages will get repetitive in short order even with the track degradation feature (which is cool). Tire options is neat, but shouldn’t be too tricky I’m assuming..longer stages require harder tires..? Looking at some of the footage it appears some of the locations are probably repeats of previous games only with the saturation turned up to 11. Argentina should be welcome though. Being a Rally fan I can never get tired of the car selection, but just hope the stages don’t get stale after a while. Also need the offline career mode to be similar to D4 with the crew development aspect. That’s the main reason I preferred D4 over DR1. Kylotonn have the licenses but can't get it right,CodeMasters get most aspects right but suffer from lack of content.Anybody else see a solution here? Codemaster as "official racing games hub" would be perfect with F1, WRC and RX but sadly is not going to happen. Actually dr1content plus dr2 content would make up for almost a full rally season (12 rallies) buy right now we don't know if dr1 rallies will be added later. On the other hand WRC 7 was quite good so i am quite confident that WRC 8 will an improvement, considering also the 2 yrs gap. @cjr3559 locations on launch are completely new. Some of them probably share some assets with the 'tiles' from D4 (because a Catalan tree is a Catalan tree) but the handcrafted stages are all completely new. Likely some 'old' locations (stages from DR1) will be upgraded (new textures, spectator/marshal models, degradation, upgraded AI, space to drive to marshal at end) added in after launch but that's TBC. Is this me or why the HUD is rather similar in style to Forza Horizon 3&4? I'm generally a hater of everything, but when it comes to driving games, they are not only the best at making them, but also one of the few who can actually make an enjoyable game (at least when it comes to the PC). I love their games: F1s, Dirts, Tocas, keep up the good work, Codies! Racing games simply wouldn't be what they are now if it weren't for Codemasters. CHEN255, soundfx and MarcoM like this. I respect your opinions but you should take a step back and look at the bugger picture, especially your first post criticising the DLC. It's very rare, in fact I can only count one other time, that codemasters ever offered to have post launch DLC. And that was Dirt 3, and it all materialised. So I don't get the hate there. I also don't think anyone understands the undertaking of making new content. The whole engine has been ripped apart and rebuilt in most areas, we have 6 brand new locations with degrading stages, new weather and lighting effects, a glut of new cars, post launch expansions, are we really expecting them to double the location count in the same period of time or did we want to wait until 2022 to get a new dirt game? Even updating the old DR stages will take time with the new environmental physics and graphic effects. Or again, would you all be happy with 4 year out of date looking locations? As @Rodger Davies has said. Look at the changes, everything most people asked for from DR1 is now being realised in DR2. This stuff takes time to develope and costs money as you have to employ people to develop it. Codemasters are a relatively small studio with a relatively small budget and I think we should be applauding them for the job they are doing. Not hating on them because they aren't doing what you want them to do. RoccoTTS, CHEN255, soundfx and 2 others like this. I'm only interested in the Rallycross part of Dirt 2.0. TheHun99, kembro and MagpieRacer like this. Looks like a strong Rallycross offering this time round too. Cant wait to have a crack at Silverstone with the Megane. The RX Tyre physics have always been so good as well so should be a lot of fun to do a full RX career. Instead of wasting time with this track degradation thing (which sounds good on the paper, but probably won't really matter; same thing with Live Track from PC2) they could port stage generator from D4. Having a mix of a few static tracks + stage generator would enable them to keep this game alive for ever. They could release DLCs every now and then with just new parts added for stage generator and the game would never get old. What I ask myself is why the DIRT franchise has some issues that've been hitting them for years while their F1 game does do better and better. What engine is F1 2018 running? Photomode is implemented in F1, why not in DIRT? How come DIRT still has the car turning around a PIVOT while F1 doesn't seem to have it? Tarmacphysics still seem an issue....F1 2018 doesn't have this problem. I mean don't they share expertise between teams? I'd rather have degrading stages, which are a huge part of real rallying. It's been confirmed by people who have played that it does have an impact on your stages times. Your stage is ok but it isn't as challenging or as fun as it should have been. Rallying is very different to F1. The Tyre data for the F1 game is totally meaningless for anything else, so why would they share it? I mean it's very difficult to compare the two anyway, replay cameras are more resctrictice by the nature of rallying. Also the cars don't turn on a pivot and haven't done for some time in the dirt games. Well I meant to see the feel on tarmac that is recreated. Of course the 2 sports are very different but input could still be valuable since there has been so much debate about it. The griplevels and speeds are different but driving on tarmac and the feel that comes with it should be shareable. Soon enough I can find out myself but I am a bit worried (that could be for no valid reason though). The pivoting is very obvious during the replays. Maybe I've should pointed that out. Can't say I've noticed pivoting so clearly not that obvious to everyone. And it's certainly isn't reflected in the driving feel. Regarding the tyres, tarmac is about the only thing that can be consistent between the two, the data would just be completely irrelevant to Dirt. Pirelli F1 Tyre data will not be the same as cut grooved road rally tyres. So why would they bother sharing any information at all?